Having thouroughly cleaned and repaired your walls we then decorate and protect the exterior of your property with a Homeshield wall coating system and make frequent, costly and disruptive decorating and maintenance a thing of the past. With guarantees on our spray applied wall coatings being as long as 15 years (and likely life expectancy well in excess of this) the likelihood is that you will never have to paint again. Choose from smooth coatings and clear coatings right through to a range of different textured finishes all designed to enhance and protect the exterior of your home and leave it virtually maintenance free for years to come… forget about regular painting. 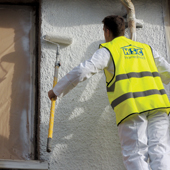 Applying a textured coating from Homeshield, the UK's largest wall coating company, will totally renovate the exterior walls of your property, leaving a uniformed, attractive, long-lasting weatherproof finish with a full 15 year guarantee (Insurance backed free of charge). Ideal for brick, stone, render, pebbledash and Tyrolean, etc. (a clear finish is also available for brick and stone). All surfaces must be thoroughly cleaned by either power washing or if required wire brushing. Years of grime, mould, algae and other contaminants are removed. All loosely adhered or delaminated paint work is removed. A process known as 'needle-gunning' may be required. This will identify any damaged render, Brickwork, roughcast, pebbledash etc. 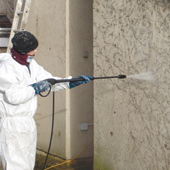 A biocidal wash is then applied to eliminate any underlying spores and prohibit any further re-growth in years to come. This process protects all doors, windows, paths and surrounding areas that are not being treated. This is achieved by masking up with tape, heavy duty paper, polythene and dust sheets. Great care is taken to protect driveways and adjoining properties. Damaged render and decaying brickwork is removed and all cracks are chased out. 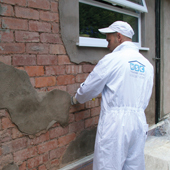 Fibre re-inforced, polymer-modified cements (GRC) are used for repairs to ensure a perfect bond. 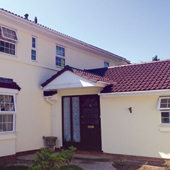 Previously unpainted areas such as brickwork or pebbledash then benefit from a 'fairing' coat with polymer-modified render to fill small air holes and soften any brick lines. Homeshield Primer coat has been formulated to act as a Stabilising/primary coat with up to 50% penetrating into the substrate and 50%. Forming a protective surface coating. 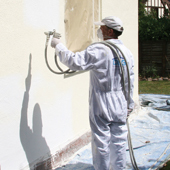 The Primer coat also stabilises the substrate, counter-acting against. the alkali inherent in all walls and helps form the perfect key for the Homeshield top coat. The subsequent Homeshield finish/top coat bonds with the Primer coat to form a bond of incredible strength. Coatings are sprayed on to surfaces using specialist heavy duty spray equipment at up to 50-75psi air pressure. The complete system is up to 20 times thicker than conventional paint The textured finish helps conceal as far as possible any repair work and dries to a beautiful, uniform finish. Following completion your property will be left in a clean and tidy condition. In some instances a property will be better suited to and your preference may be for a smooth coating. 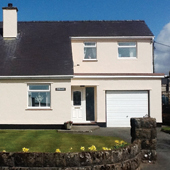 Smooth rendered walls, painted face brickwork, listed buildings or even pebble-dashed walls in good condition all can be treated with Homeshield's smooth coatings.